Chicago is gearing up for the Scorpions return to North America this fall with special guests Megadeth on select dates. The legendary German band will be having one of the BIG 4 great thrash metal bands for a 16 city tour across the U.S. and Canada. “When our album Crazy World was released back in ’91, right at the end of the cold war, we toured around a world that was pretty crazy back then, but there was so much hope in the air for a more peaceful future. Now 26 years later, things are getting more crazy every other day. After all these years, ‘Crazy World’ is still a good motto for our upcoming world tour. We are very much looking forward to seeing all of you out there,” states Klaus Meine. With over 100 million records sold around the world, the band will play fan favorites from their incredible catalogue including “Wind of Change,” “Still Loving You,” “Rock You Like A Hurricane,” “Send Me An Angel” and many more. They’ll also be performing songs off their 19th studio album and most recent release, Return To Forever. 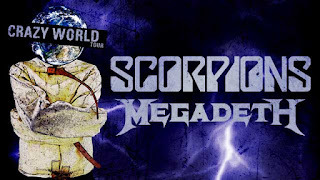 The Scorpions continue touring behind their 18th studio Return to Forever while Megadeth is supporting their latest release Dystopia, which hit shelves Jan. 22, 2016 via Tradecraft/Universal. Megadeth picked up their first-ever Grammy for the album's title track at the 59th Grammy Awards, held Feb. 12 in Los Angeles. Get your tickets and get ready to enjoy one hell off a tour from two powerhouse bands on one stage.